SkyORB for Mac is more than a simple star map, it's a collection of 7 tools including a 3D star map, 3D planetarium, ephemeris, search engine, weather, sun clock and more for Mac OS X users. SkyORB for Mac includes a comprehensive search function allowing you to view the night sky from any point on earth. SkyORB for Mac is now entirely rewritten for better performance and user experience. 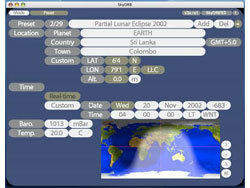 Astronomy software for iOS, WebOS, MacOS Snow Leopard and Windows Vista/ 7. ...... version. Also features time and location customisation. Now available for the Mac App Store. Entirely optimized for OpenGL 2.1, 64-bit, Grand Central Dispatch for multiprocessor support and entirely rewritten in Objective C 2.0, "SkyORB 3D for Mac OS X Snow Leopard" is much faster to use and is 5x faster than SkyORB 08 on the same machine. New user interface. New features added. * Moon phase with date of full and new moons. * Universal search engine for locating every objects you want. * Both OpenGL ES 1.1 and OpenGL ES 2.0 support. Qweas is providing links to SkyORB for Mac 4.0.2 as a courtesy, and makes no representations regarding SkyORB for Mac or any other applications or any information related thereto. Any questions, complaints or claims regarding this application SkyORB for Mac 4.0.2 must be directed to the appropriate software vendor. You may click the publisher link of SkyORB for Mac on the top of this page to get more details about the vendor.